Since I am on the road for work four days a week, I was looking for a wireless mouse that I wouldn’t mind using all day. At the recommendation of a colleague, I picked up the Logitech MX Anywhere. I’ve used this mouse for almost six months and have found that the Logitech MX Anywhere mouse is truly a gem; it tracks on glass surfaces, has great battery life, never loses connectivity, and is comfortable to use. 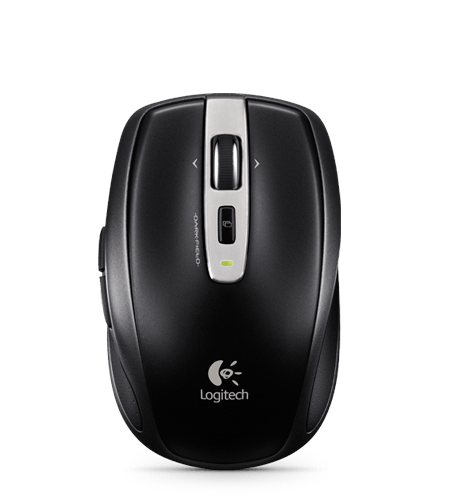 The Logitech Unifying receiver seems to be much more stable than Bluetooth, so this mouse should elicit a sigh of relief from anyone who has struggle with a Bluetooth mouse losing its connection. I’ve used the mouse to control my computer across a small classroom without any issues and have never had connection problems. The two AA batteries that power this mouse last for a long time, especially if you turn the mouse off during the night using the integrated optical sensor cover. Using the mouse all day, I’ve been able to get 3-4 months out of a pair of batteries. Where this mouse really shines is when you’re trying to track on clear surfaces. The performance isn’t flawless, but the Logitech MX Anywhere performs far better on glass surfaces than any other optical mouse I’ve used. The included Unifying receiver is small enough that I leave it plugged into my laptop. If you prefer to not keep the receiver attached to your laptop or switch computers often, the mouse has a place to store the receiver in a compartment under the battery. The mouse also comes with a leather zippered pouch, which is completely excessive, but it just makes the whole package a bit nicer. Overall, the Logitech Anywhere MX mouse is an exceptionally well-designed product. It is comfortable to use as a primary mouse, has monster battery life, and tracks on glass. I take my Logitech Anywhere MX with me whenever I take my laptop. I’m switching to American Airlines… for now. I’ve seen A LOT of people with the Microsoft Arc mouse, so it is certainly a popular choice and I do like how it folds up. Maybe I should take one out for a spin. I always seem to find hotel rooms with glass surfaces on the desks…and I got quite tired of using a notepad as a mousing surface.